The Retreat at Blue Lagoon warms the hearts of its guests—soothing them into total relaxation with Iceland’s natural beauty as its backdrop. It may be every woman’s dream to take a dip in the fountain of youth. And if she’s willing to travel to Iceland, she may get the chance. Iceland is home to the Blue Lagoon. The lagoon itself, while surrounded by an incredible natural lava landscape, is not nature-made. It is the byproduct of the neighboring geothermal power plant, which pumps a fresh batch of the mineral-rich hot water into the lagoon every two days. It wasn’t long before researchers confirmed the healing properties of these geothermal waters—specifically the water’s primary components of silica, algae, and minerals. In case after case, people suffering from skin conditions saw significant improvements, if not a complete cure. It’s these elements that became the foundation of Iceland’s first luxury hotel, the Retreat, which opened in April 2018. Direct from Chicago on Icelandair, flight time to Iceland is just shy of six hours. Iceland has strategically positioned itself as a wonderful layover spot as American travelers make their way to Europe. 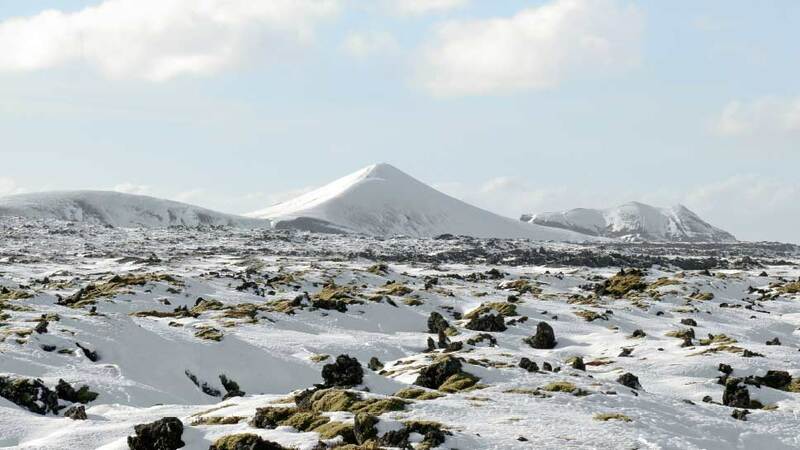 Icelandair is happy to work with tourists to arrange such a stop. Even though it was an easy flight and a brief cab ride to the Retreat, it was still such a relief to arrive at the 62-suite luxe property and immediately feel a sense of warmth and relaxation. 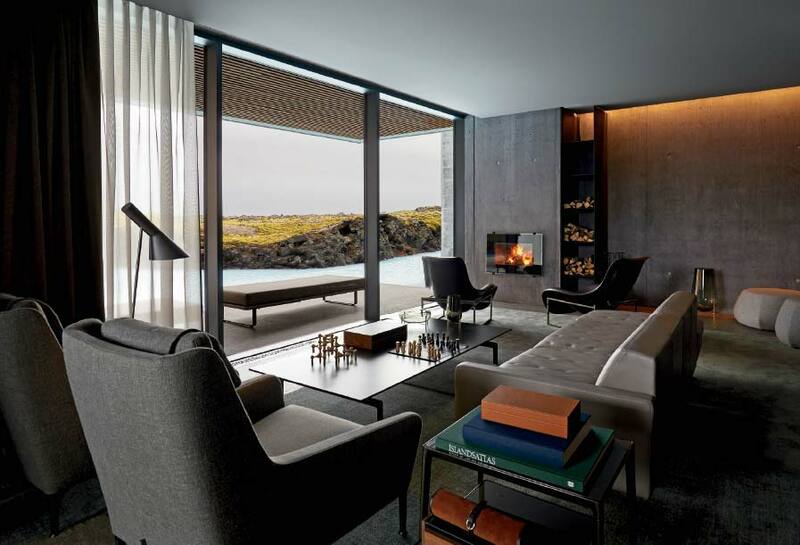 The Retreat embodies the best the Blue Lagoon has to offer from its impeccable architecture, five-star hospitality, Michelin-inspired food, and its carefully curated collection of Icelandic art. But it’s the spa that sets this hotel apart from any other. Built into an 800-year-old lava flow on the south shore of the Blue Lagoon, the Retreat Spa is the convergence of nature, architecture, and the radiant powers of the geothermal seawater. The spa offers all sorts of possibilities from dry heat, massage, relaxation with panoramic views, the Blue Lagoon’s signature Ritual, and the mineral-rich warm waters of the Retreat Lagoon. It’s no wonder that the Retreat’s “vacation uniform” is a white quilted robe. Guests wander the halls, enjoy the restaurants, and partake of the spa all in the comfort of their complimentary loungewear. Almost immediately upon check in, I was whisked away to my 60-minute in-water massage. It was a perfect introduction to the awe-inspiring Blue Lagoon—floating on top of the water (with the help of a yoga mat), covered in a blanket, and being massaged from head to toe as the steam rose from the beautiful waters. I quickly forgot that it was November—in Iceland. After a quick, healthy bite in the Spa restaurant, I embarked on the Spa’s signature Ritual. A self-guided treatment based on the Blue Lagoon’s three primary elements—minerals, silica, and algae—the Ritual takes place in three interconnected underground chambers. The first experience is designed to renew skin and stimulate circulation through a mineral lava salt scrub, followed by a rinse under a rain shower for the restorative effects of the geothermal seawater’s mineral treasures. Next, after being offered a glass of iced tea, I moved to the silica chamber to experience the silica in its purest form, which works as a mask to draw out impurities leaving skin with the most amazing glow. Finally, after rinsing the silica away, I applied the lagoon’s algae that quite literally made my skin feel smoother, younger, and more refreshed. can continue to do so online from the states. The Blue Lagoon is the number one destination for Icelandic visitors. While the country only boasts 350,000 residents, more than 2 million tourists visit the Blue Lagoon each year. While it’s easy to catch a tour bus from the airport to the Blue Lagoon, one truly experiences the serenity of Iceland’s waters as a guest of the Retreat. With its own private entrance to the lagoon, Retreat visitors are virtually unaware of the hundreds of people swimming nearby—unless they would like to be. Access to the public waters is available to those who are interested. The Retreat has created a cocoon-like experience where you don’t need to leave the property to get a true sense of Iceland and its people. Staying in the Junior Moss Suite, walls of glass open up to panoramic vistas of ever-changing moss. Sweeping lava fields unfold into the volcanic horizon, which can be enjoyed from a private balcony or the deep soaking tub nestled in the corner of the room. There is no minimum for booking one of the junior suites. Each Junior Moss Suite includes complementary breakfast, mini bar, Blue Lagoon skincare amenities, and turndown service. Additionally, you can ask the Retreat staff for a special wakeup call should the Northern Lights make an appearance. The Northern Lights is another enormous draw to Iceland. They are the result of electrically charged particles from the sun colliding with gaseous particles in the Earth’s atmosphere, causing displays of bright, colorful dancing lights that range from white, green, pink, to purple. Experts say that the best time to see the Northern Lights is from September to mid-April as these are the months where there are full dark nights. To get the best odds of seeing them, it’s recommended you stay a minimum of seven nights in the country. The Northern Lights usually tend to be very active for two to three nights, then low for four to five nights, in ongoing cycles. The longer time you spend in the country, the higher your chances of seeing them. A review of the Retreat would be incomplete without mentioning the food. 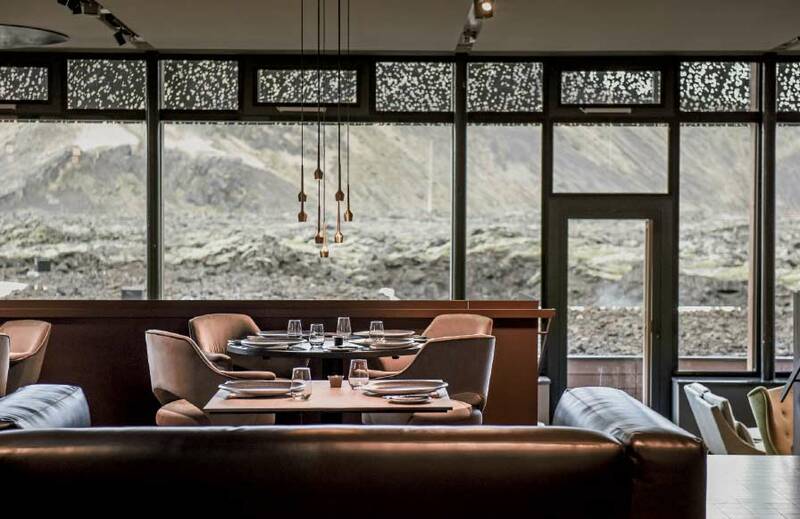 On the Blue Lagoon side, Lava Restaurant, built down into the lava itself, serves Icelandic-caught seafood, lamb, and other local delicacies true to the country. The resort’s new Moss Restaurant, complete with a wine cellar, wows with a seven-course wine-paired dinner. In the afternoon, Illy coffee drinks and light snacks are served in the lobby. The Retreat at the Blue Lagoon is restorative for the mind, body, and spirit. Whether you visit Iceland for three hours or three days, you’ll forever be changed by the wonders of its natural landscape. Accommodations at the Retreat at the Blue Lagoon range from $1,144 for the Junior Moss Suite to $2,383 per night for the Lagoon Suite. For more information, visit bluelagoon.com.